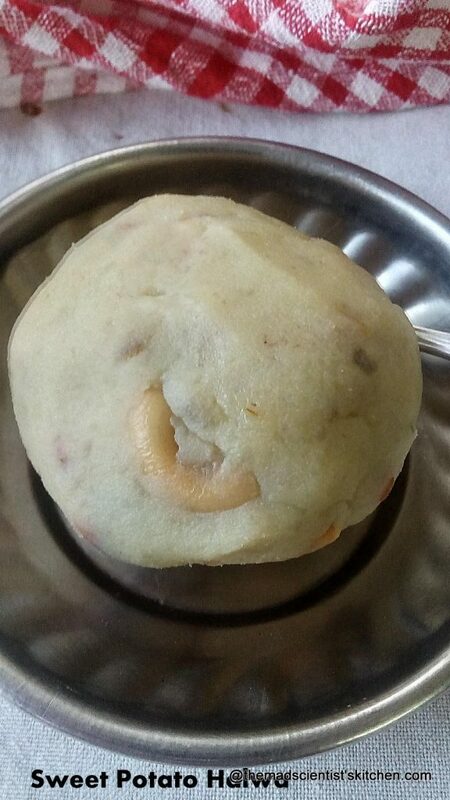 Sweet Potato Halwa( Ratalyacha God Halwa) is delicious and quick dessert, serve it as a dessert or as a fasting recipe. This method of making halwa is different from the Kees or Ratalyacha sheera ( recipe coming)that I make regularly and I quite liked the taste of this Halwa the added advantage is it is faster. This recipe is adapted from here. In my place, only one person namely me eats sweets. My Father-in-law too enjoys sweets but I did not offer this to him. So now I need to redo this recipe can do it for Gudi Padwa that is coming up. I will then update the post with better pictures. This is very addictive halwa (like all other halwas ) namely Beetroot Halwa, an Indian Dessert, Gajar Ka Halwa, Doodhi Halwa or Bottle Gourd Halwa so take care. 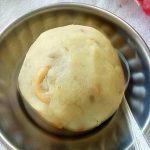 Now I can safely say you will love this recipe that Sharmila also called Sakkaraivalli Kizhangu Halwa. Soak Saffron in the milk and the condensed milk and set aside. Pressure-cook the Sweet potato for 2 whistles. Let the pressure come down naturally. Allow the sweet potato to cool down and the peel of the skin and mash it see that there are no lumps. Heat 2 tbsp ghee in a kadhai/wok add in the nuts fry till golden brown drain and set aside. In the kadhai/wok add the mashed sweet potato and allow it to cook for 5 minutes on a low flame. Add the sugar it will melt immediately add the saffron soaked condensed milk. Add the cardamom powder and then ghee fried nuts and keep stirring the halwa. It will tend to become thick now and leaves the sides of the pan. Reserve some of the nuts then you need not prise them from the halwa. Serve the halwa with love. Looks nice.. this is perfect for fasting days. 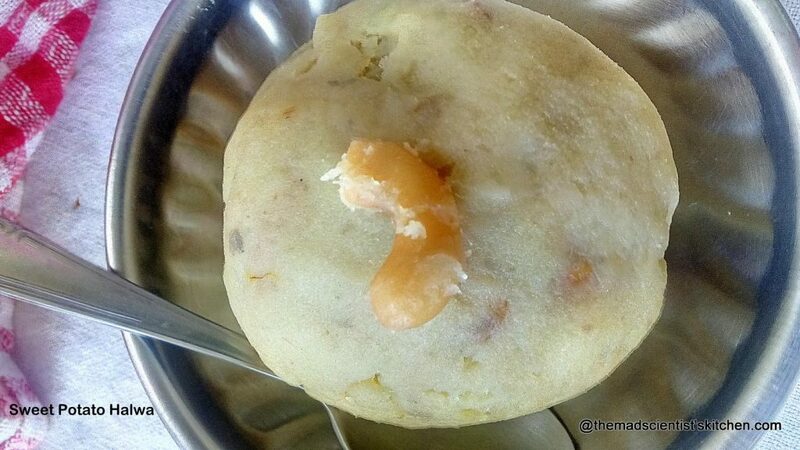 Omg, seriosuly i want to finish that alluring halwa, am planning to make halwa with sweet potatoes since a long and here you are. Fantastic Archana. Ping me when you do. This is my favorite halwa on fasting days. Looks so rich and delicious. Healthy Sweet potato halwa apt for kids.. we love homemade halwa, best for sweet tooth people. This is absolutely a delicious sweet. Wow! So many interesting recipes using sweet potato.. yum ! Something new for me. Bookmarking this recipe .I am sure it tastes yum. Something new for me. Bookmarking this halwa recipe. I am sure it tastes yum. Something new for me. Bookmarking this wonderful recipe. Fantastic share. Wow yummyyy Halwa.. love it. Perfect with fasting days ..lovely share .. Perfect share for any festivities, deliciously yum !! Yumm, it’s really sweet dish, sweet potato, sugar and condensed milk. I too have a sweet tooth(infact whole set) but can’t take so much risk for my health. How I wish I had a chance to grab this bowl. You can avoid the condensed milk and make a small minuscule portion. easy an delicious halwa. have never tried making halwa with sweet potato. Try and you will love it. Thanks Archana for the mention 🙂 Halwa has turned out perfectly awesome and glad you liked it !! This recipe looks great for when you have an instant sweet craving.My mum used to make this when she was fasting. So you will agree it tastes amazing. By looking at recipe name I thought you made pink yam halwa:) but when I saw pictures then I realised that you have used sweet potatoes. Such a tempting and delicious halwa. 😀 Now I will go in the hunt of pink yam I hope it is something I can source. 😀 Ping me will love to see the styling and the changes you will make. I love this totally! I am a big sheera fan, be it Kesari as we southies make or the basic semolina sheera I am a big fan. Sweet potato is super good for health and this is my snack early morning before i head for a walk as it keeps me energetic. 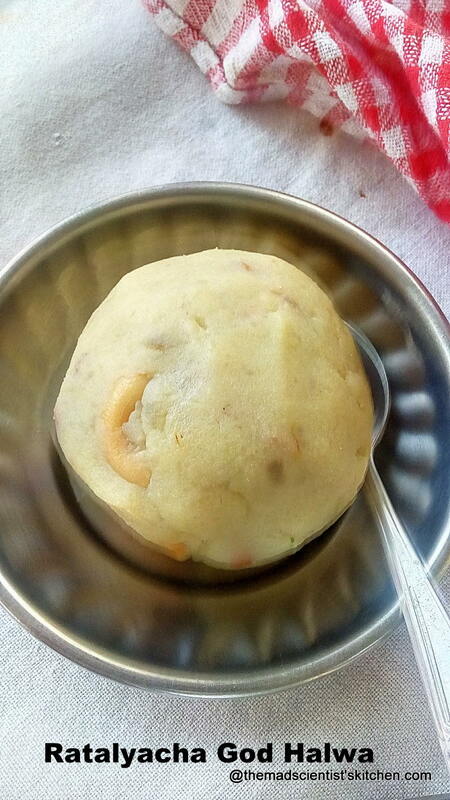 Without using any semolina, you have achieved the perfect texture of the halwa, super! Kids these days are so lost in their candies, they miss out on all these yum snacks. Heee! was hoping you will say that. We seem to be birds of the same feather. Wow halwa made with sweet potato — now that sounds both nutritious and delicious. Perfect to make for festivals — will have to try it some time soon. Do try and let me know PJ. Let me know how Lil’ Dude and Angel like it too. Sweet potatao halwa looking delicious and very inviting. So far I cooked sweet potato in the form of chat, boiled sweet potato or fries. This looks good one to try. A delicious looking halwa. I love sweet potato and I’m sure I’ll love this halwa too. A great treat for fasting days. The halwa looks delicious Archana! Sweei potato halwa is my favourite.. I like it with jaggery. We even make it like semi-mashed halwa. Even my sister talked about making it with jaggery. Now I must try it out.